Unfortunately I do not have a book for you today. I’m currently reading The Master and Margarita, but I’m not ready to post about it yet…so if you’re feeling overdue for a Literary Bite…I was recently reminded of Peace Like A River (thanks to my Book Trivia Flip Calendar). That book was so good! Read my review here. You all know that I love my weekends, but I want you to know that there is more to my life than eating, running, and reading. Much more. Sometimes too much more! Maybe I’m spreading myself too thin (haha, peanut butter metaphor – love it! ), but I really like everything I do and I don’t know what I could/would eliminate. 8-9:20am - House Job frantic work catch-up (I’m kind of my own supervisor on this one, so though I don’t usually procrastinate, sometimes things pile up…). 9:30-5:50 – Work (my “real” job). 5:50-9:20 - I leave work a little bit early on Mondays so that I can catch the Red Line to the Green Line to the F4 bus to get to 64th Avenue in Riverdale MD. This process takes about an hour and involves way too many people and forms of transportation! 9:30-10:15 – So you know that I do yoga regularly. The reason I can afford this is because I am a "Karma-Yogi." This means that I clean the yoga studio once a week in exchange for 2 free classes a week. It’s a pretty sweet deal, except that after an already 15-hour day when I haven’t eaten since lunch the last thing I want to do is mop floors in a 100+ degrees yoga studio. 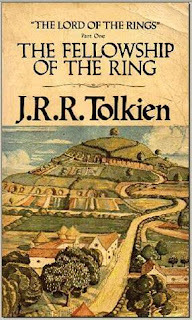 10:20 – bedtime - Shower, bowl-o-food on my couch, LOTR, read, go to sleep. Ugh - Mondays are sooo long! I rewarded myself for such a long Monday by sleeping in until 8:30. Yay! 6-9 – Track practice. 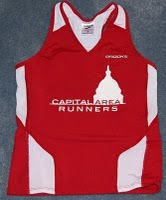 I change at work and take the metro to Ballston, and we work out at the Washington Lee High School Track. SpeedyKate usually drive me home (LOVE anyone/everyone who drives me places!). 9-bedtime – Shower, make/eat dinner, LOTR, read, go to sleep. 6-8:30 – I planned on running…but I just couldn’t do it. As I walked home from work, feeling the humidity and seeing the Dupont thermometer register 105* (which was definitely an exaggeration, but still! ), I made the executive decision to nap instead. So I power-napped, did laundry, and made/ate dinner. 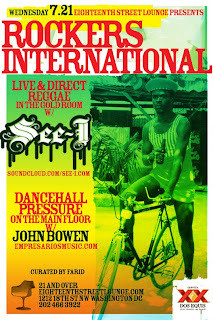 8:30-midnight – I met friends for Live Reggae Night at 18th Street Lounge. I loved it! Live music is always fun – you know I’m an enthusiastic dancer – and when I’m just feet away from a trumpet, sax, trombone, and bongo drums you know it’s a good time! This place is great – they have free pita and hummus at happy hour, and there’s no cover until 10pm. Midnight-1am – I got home, showered, and should have gone straight to bed. But I got side-tracked by cookies and The Return of the King…so I didn’t go to bed until 1. Poor choice. 6:50 – The extreme poorness of my choice was reinforced when my alarm went off at 6:50am to meet 6x6 for a run. Kill me. 9 am – Work. I’m leaving work early today to catch a bus to Philly to do Something Awful. The good news is that it involves Jess. The bad news is that it also involves 8.4 miles. And 9.2 miles. All in one day. In New Jersey. Again, kill me. Obviously you will get all the details on that later! So there you have it. Almost a whole week in my life. And that is why I'm tired! By now I've had 4 different coaches, each of which one has specific workout preferences. In high school I had a coach who liked doing this track workout where he would blow a whistle to indicate a change in pace (i.e. tweet = run fast, tweet again = slow down). Only he knew how long each rep was going to be (ugh, that was awful! We never knew if we'd be running hard for 1 minute or 5!). And hill repeats - oh hill repeats - another coach thought they were God's gift to running. It seemed like everything we did involved running uphill at varying paces. But despite each coach's specific preferences, some workouts just keep showing up whether I'm running with Coach P., Jim, Bruce, or George in California, Boston, or DC. One of these workouts is the 3K-1500m-1500m, or for those of you running on a track (or metrically challenged), 2 mile-mile-mile. In Boston we did this workout almost weekly. 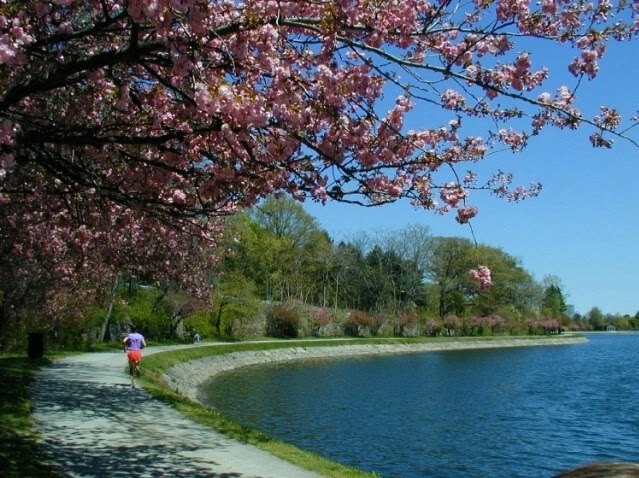 We ran at the Chestnut Hill Reservoir (3K around), or the Brookline Reservoir (15oom around). In DC we do it on a track, so it becomes 2 miles-mile-mile. The purpose of this workout is to build your speed and endurance by maintaining a hard pace over an extended period of time. The first rep (the 3K or 2 mile) should be barely faster than your tempo pace. The purpose of this rep is to get you tired, but not I-need-to-lie-down kind of tired. When you finish the 2 mile you should feel like Hmm, that actually wasn't too bad. Don't go out too hard - trust me on this, you'll regret it. Take a 1/2 mile or 5-6 minute jog recovery. For the first mile, speed up a bit. Try to run it at least 10 seconds faster than your 2 mile pace. 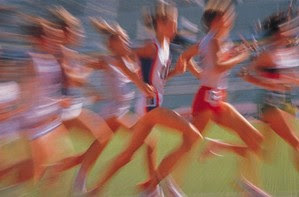 You will notice that as you run this mile your legs start to feel it. But, again, don't run so hard that you can't maintain an even pace through at least 2 reps. Jog 1/2 mile for recovery. By the time you start the last mile, you should feel fatigued but not spent. This simulates the way your legs feel towards the end of a race. As SpeedyKate so wisely said last night, You want to be at that point where you have to run faster to keep from slowing down. By the end of the second mile you should be tired and done. If you're not too tired, or if you're training for something longer (i.e. a half or full marathon), do another mile. For us mere mortals, the 3 reps is plenty! With a 10 minute warm-up and a 20 minute cool-down, this workout rounds out a solid 9 miles. Phew! Now it's time for me to ice and lie down (on my couch with a big bowl-o-dinner and LOTR)...only to get up 7 hours later for 6 am yoga...well, someday I will go on vacation and actually rest! Oh my goodness. I know I keep saying this…but this may be the BEST cake I’ve ever made. 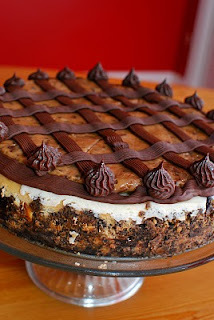 It rivals the epic cheesecake in the beauty category. And texture? 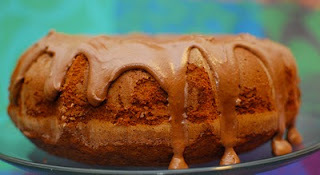 It may beat out the Mint Chocolate Pound Cake. And overall taste? 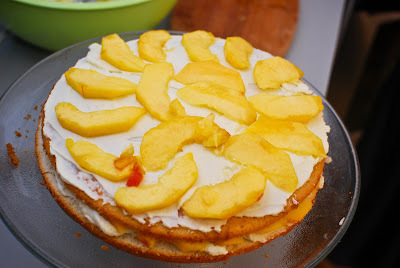 Well the Key Lime Cake put up a good fight, but fresh peaches + mascarpone cream + whipped cream frosting = can anything compare??? I think not. Get excited. Get jealous. 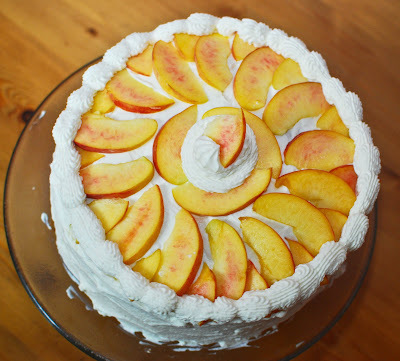 I bring you the Summer Peach Chantilly Cake. I’ve been very into summer fruit recently (that’s pretty much the only good that comes from this hotter-than-the-gates-of-hell July). 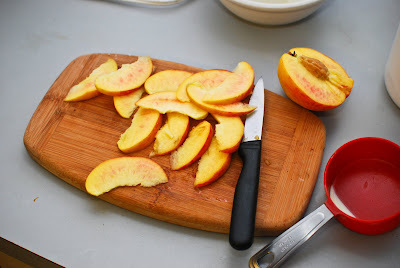 Every Sunday and Thursday the Farmer’s Market free samples remind me how good juicy ripe sunny peaches are. I’m pretty sure I sampled a white nectarine and said (out loud) Oh wow, this is what summer tastes like! I've only spent 2 of the last 7 summers at home: the summer before my senior year of high school, and the summer before I went to Niger my junior year of college. In both instances, I worked at the Petaluma Whole Foods in the espresso bar/juice bar/bakery department. My love of coffee was well established before then (thanks to a job at a drive through coffee shop, i.e. the best job ever! ), but behind the Whole Foods counter was where my smoothie experience began, and where my love of cake developed. I was the girl who put out samples. All the time. Because I like sampling, and I like to make other people happy with cake/cookie/pie samples too! And I still love making people treats. There’s something really satisfying and oddly fulfilling about coming up with an idea, executing that idea, and then watching people appreciate it. 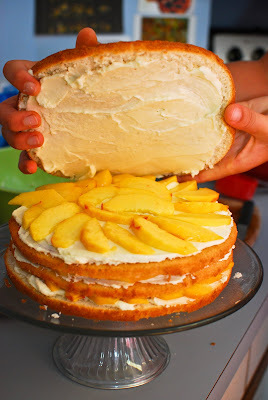 To me, that’s what baking is all about – spreading the cake love! Because what’s the point of making something if it isn’t going to be enjoyed? 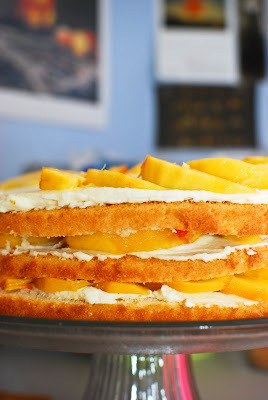 I remembered a Peach Chantilly Cake from Whole Foods…and it involved mascarpone filling…so I took those two components as my inspiration and got started baking. 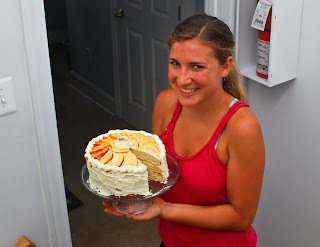 I made the same white cake that I used for the Oreo Cake (sans Oreos of course). 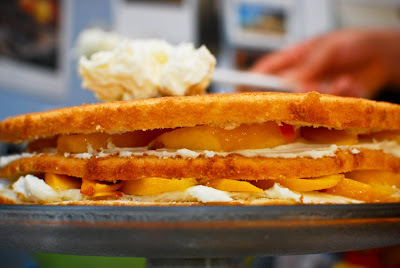 I then layered sliced peaches with mascarpone cheese filling, and then covered the whole shebang with whipped cream frosting. 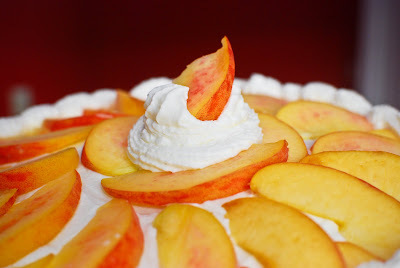 The cake is pretty sweet and so are the peaches, so I minimized the sugar in the filling and whipped cream. Overall it balanced out to be light and delicious. Exactly the summery dessert I was going for! 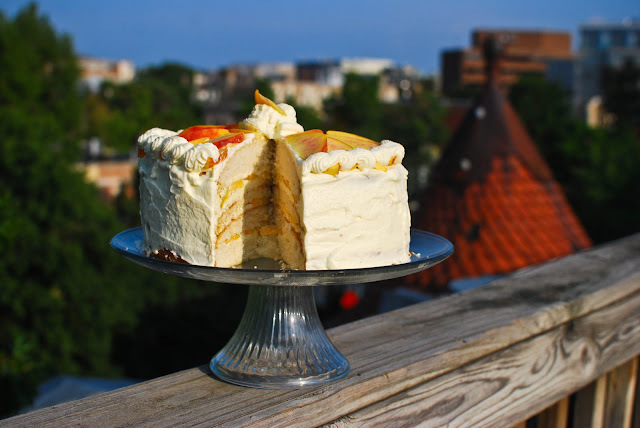 I made this cake for a rooftop house dinner (we grilled shrimp kabobs – yum!). I knew the cake was going to be good, but oh man, I don’t think I was prepared for the extreme awesomeness. One of my housemates said it was the best cake he’s ever had. 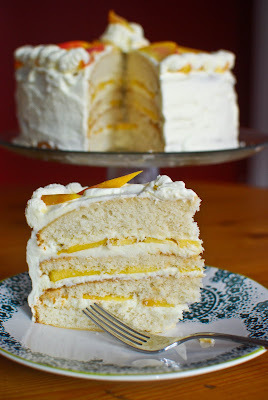 After a couple delectable bites I just couldn’t restrain myself: Guys, not to toot my own horn, but oh-my-goodness-I’m-going-to-fall-out-of-my-chair this cake is awesome! I hope you make this. And I hope you enjoy it as much as we did! Oh, and I should add that the Whipped Cream Frosting came dangerously close to being another blue cake meltdown…but then it miraculously turned around and is now my new favorite frosting! 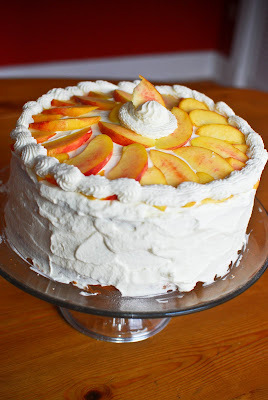 I originally followed a recipe that used gelatin to stabilize the whipped cream. But then the gelatin got too hard before I added it to the whipped cream, and just overall didn’t work. So the second time around, I didn’t cook the gelatin as long. As I panicked about the impending meltdown (and Photoman laughed hysterically) I added corn starch and meringue powder in copious amounts. And it worked!!! I cannot get over how excited I am about that particular success! Add the dry ingredients to butter mixture. Mix until integrated. Stir in sugar. With an electric mixer on low speed, beat for 30 seconds. Turn the mixer up to medium speed and beat for 2 minutes. Add the egg whites to the rest of the mixture. Beat for 2 more minutes. 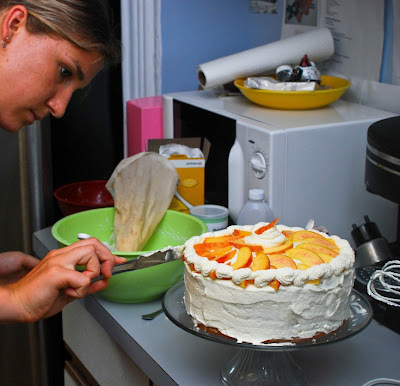 Once cakes are cooled, freeze them for at least 1 hour (to make cutting them in half easier). 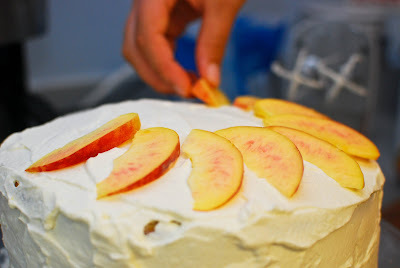 3 peaches, thinly sliced (peel 2 before slicing, leave the peal on 1 to use to decorate the top of the cake. 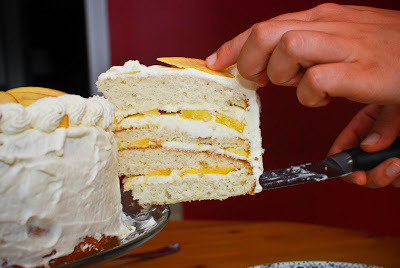 Cut the two cakes in half (to make a 4-layer cake). 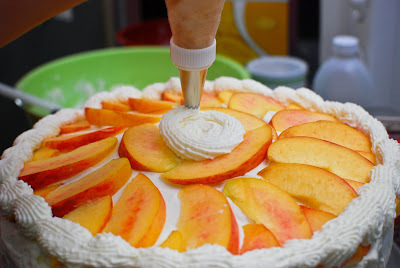 Spread mascarpone filling on the first layer, then cover with sliced peaches. Repeat with each layer. Chill mixing bowl and beaters for at least 15 minutes before using. Place water in a small microwave-safe bowl. Sprinkle gelatin over water and allow to soften 5 minutes. Dissolve gelatin by microwaving for 1 minute. Remove from microwave and let stand at room temperature for 10 minutes; gelatin must be liquid but not warm when added to cream. Remove bowl and beaters from refrigerator and pour in cream, sugar, and vanilla extract. Beat together just until beater marks begin to show distinctly. Add gelatin mixture to cream, pouring in a steady stream while beating constantly. Add meringue powder and cornstarch. Beat until stiff peaks form (this took about 5 minutes. Don’t give up – keep beating!). 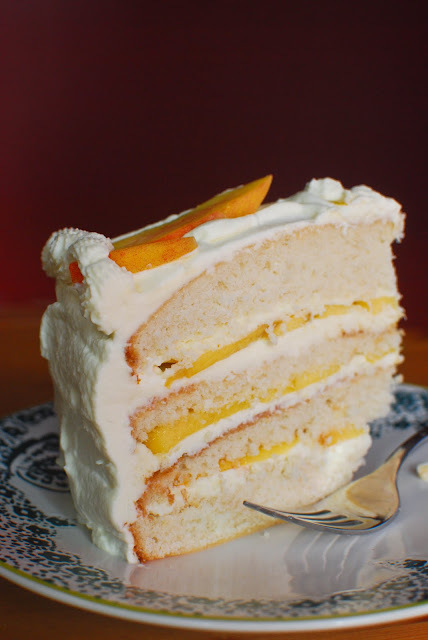 Make the Whipped Cream Frosting from this post -- it's a MUCH better recipe. Frost the outside of the cake. 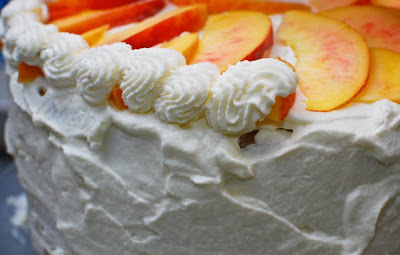 Decorate top of the cake with skin-on peach slices. 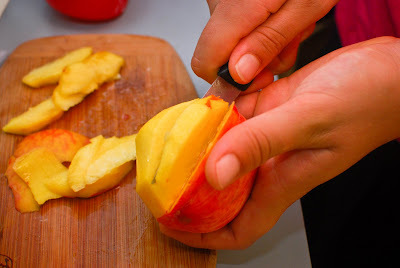 Refrigerate for at least 30 minutes (preferable longer) before cutting. Every so often I'm surprised by my own nerdiness. And for some reason, it emerged in full force this weekend. 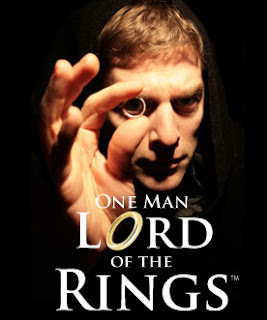 Case in point: On Thursday night I got tickets to see a one-man show of Lord of the Rings. Just so you know, I LOVE Lord of the Rings. I first read the books in junior high, and by now the trilogy is up there with Going Solo as my most read ever books. So I was getting pretty excited about this LOTR show situation. I didn't really know what to expect, but I've had good 1-person show experiences before, and it got good reviews, so I was excited. My ipod's name is Pippen. I've read the books multiple times (maybe 5?). And The Hobbit of course. But here's the ultimate-nerd part...I've also read The Silmarillian...which is pretty much like reading the Bible. And I've read The Children of Hurin, which is elf lore. Yep. So there's that...to all of you people who love Harry Potter, not to be a Harry-hater, but please read LOTR. You will be blown away by the extreme awesomeness. AND THEN by pure and perfect coincidence, LOTR was on TV Friday and Sunday nights. Done done and done. Those movies are long, and totally worth it! But my LOTR obsession is not the end of it - remember, this was a whole weekend of nerdiness. I met up with my team for a long run on Saturday. We started from the Roosevelt Island parking lot in Arlington and ran out-and-back to Fletcher's Boathouse along the Canal (that was the first 6 miles). By the time we returned to Roosevelt Island (my new favortie place to run! Each lap around the island is 1.5 miles) we had exhausted the usual runner talk of What are you training for? When did you start running? When did you join the team? etc. We then spent two lap talking about the possible outcomes of the upcoming Senate elections (which just makes us Politico nerds - not too rare around here). The next two laps (miles 9 through 12) we talked about Russian literature. The pros and cons of Tolstoy v. Dostoyevsky v. Solzhenitsyn. So upped the anti in the nerdiness department. Saturday afternoon I braved the heat and trekked to the Corcoran Museum's free summer Saturdays. 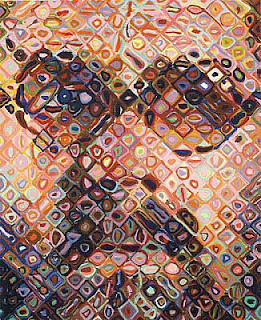 There's a pretty awesome Chuck Close exhibit going on until September 12. I consider that more "cultured" than nerdy though...nerdy would be if I made the effort to thoroughly understand the intricacies of print-making. I think I'll leave that one to the artists and maintain my status as an appreciator. In other (non-nerdy) news, I returned to Bangkok Joes. This time I went with green curry, which was good but super rich (I hope I wasn't eating pure curry-flavored cream...but I may have been). The crab cakes appetizer is good, but for $10 you only get two very small crab cakes, so heads up on that. I also returned to Fro-Zen-Yo, which was everything I remembered (and better?). Cappuccino, Peanut Butter, Red Velvet, and Peach frozen yogurt (don't worry, I didn't mix them) topped with fresh raspberries, cake crumbles, slivered almonds, and chocolate sauce. Aka exactly what I need on a hot DC day! The only drawback is that Fro-Zen-Yo doesn't have seating and it was way too hot to sit outside. So 6x6 and I literally ran with our fast-melting fro-yo to Starbucks to take advantage of their overly air conditioned coffee-scented heaven. So there you have it - I'm nerdy. And proud. Hope you had a good weekend too! Happy Birthday Eat Run Read!!!! 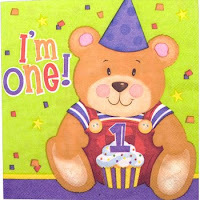 That’s right – my blog is one year old today. Two hundred forty-eight posts (forty-nine counting this one). Stacks of pages of writing (just ask my computer-less grandma – I print out all my posts and mail them to her). Fifty-three cakes. Thirty book reviews. Fifty-two Weekend Reports and too many running posts to count. August 7, 2009 – Guest Blogger 6x6 joins the team: So, This is Running? 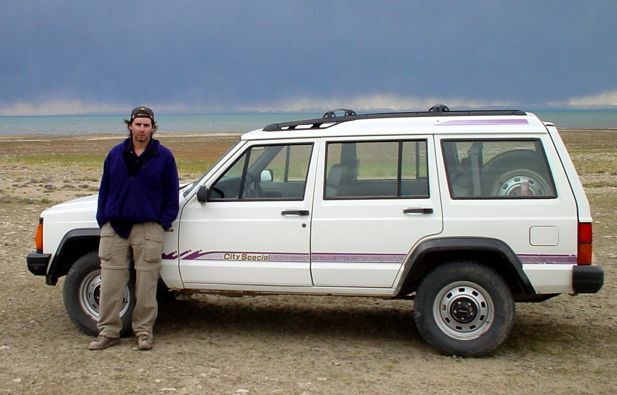 October 5, 2009 – 6x6 Runs a Race! 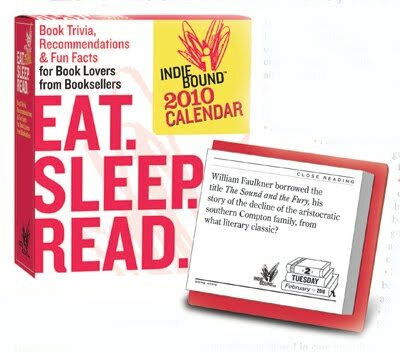 March 16, 2010 – Eat Run Read gets a new header and a completely new look thanks to the fabulous Ellie! I don’t have any shocking things-I’ve-learned-from-blogging breakthroughs. Except for a few pensive moments, this isn’t really a touchy-feely get-to-know-myself kind of blog. But I have learned one very important lesson: I like to write. A lot. And I look forward to writing every day. I never thought I had much to write about...but 365 days in and I'm still going strong. And since a birthday is a good day for introspection...what do you like about Eat Run Read? What is your favorite part? What should there be more of? What should I shut up about? I'm curious what people like, so let me know! A couple weeks ago I completely denigrated this book. I said it was boring and terrible and I QUIT reading it. Because when I first told LLC that I hated Country Driving, she explained that it was a 3-part book. The first part is about driving along the Great Wall (that was the part that should have been interesting but really wasn’t). Part 2 is about village life, and Part 3 is about a factory town. I originally quit after Part 1. If you decide to read this book, either read the whole thing and just know that it will get better…or skip Part 1 entirely. The second two parts were more about people then cars, and were more similar to Hessler’s first book, River Town, which I loved. Part 2 is about the “Old China,” a country village with only one child left, and the gradual modernization of that village. 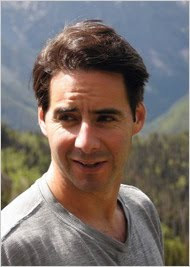 Hessler becomes close with one family, and the characters feel very real and interesting. And that, my friends, is an example of humility and openmindedness. I was wrong and I admit it. If you read this book, let me know what you think! Check out this NYT review. 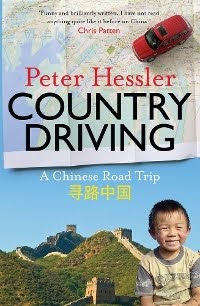 Click here to read Hessler's short story (an excerpt from the book), "How I Got My Chinese Drivers License."